Submitted by CAphyl on March 24, 2015 – 1:46pm. I keep trying to improve my gluten-free bakes. It is so hard to achieve anything close to my gluten loaves, but I did have some improvement on this one. I altered the recipe slightly (see below). The dough is difficult to work with and doesn’t hang together too well, so you have to stick with it. It is also a very heavy loaf…very filling. 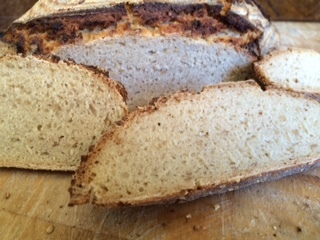 I used the start of Nicole Hunn’s “No-Rye Rye Bread” for this recipe, but altered it quite a bit. Gluten-free bread is frustrating, but I really wanted to make a sourdough loaf that was edible. I made a sourdough starter from gluten-free flour and kept it in the refrigerator. 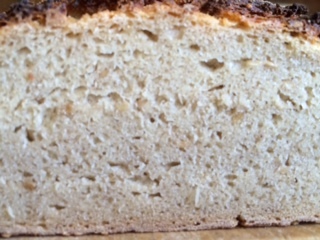 I used Nicole’s recipe, but it is confusing and complicated, so when I refreshed it, I just used gluten-free brown rice, oat and tapioca flours. It perked up very well. Place the starter into the bowl of your stand mixer and add the water; mix using your paddle attachment for a few minutes. Add the bread flour until it is incorporated and switch to the dough hook and knead for about two minutes. Transfer to a lightly oiled bowl, cover with plastic and place it in a warm location until the starter has doubled in size (at least 6-8 hours). Once the starter has doubled, add it to your stand mixer bowl along with the water. Mix with the paddle attachment (or by hand) for one minute. Add the bread flour and whole wheat flours and switch to the dough hook. Mix on low speed and knead. Add the salt and mix on medium speed for about three minutes. Add the seeds and mix until incorporated. Place the dough in the refrigerator in a lightly oiled bowl for at least 12 hours or until it is doubled in size. I left it for more than 24 hours. Take the dough out of refrigerator, ease onto a floured surface and shape into a ball. Place into a banneton coated with brown rice flour (gluten-free). Place in the refrigerator overnight. On baking day, preheat your domed covered baker to 500 degrees. Sprinkle some corn meal (gluten-free) into the bottom tray and place the bread on top of the corn meal. Spray lightly with water and score as desired. Bake at 500 degrees with the lid on for 30 minutes and then remove the lid and bake at 450 for another 15-20 minutes. Cool on a wire rack for at least 30 minute before slicing.